After the war, the General lived in Edinburgh until his death in 1994 at the age of over 102. At his own request, he was buried in Breda in the Netherlands. was held in the Garden Lobby of the Scottish Parliament with over 100 people present. Following an introduction by Ms Jean Urquhart MSP, H.E. the Polish Ambassador Mr Witold Sobków, Mr Humza Yousaf MSP, the Minister for Europe and International Development, and Captain (Ret’d) Zbigniew Mieczkowski gave short speeches. The latter spoke about General Maczek, reminding those present that his talk was intended only to bring back the General’s love of Scotland where he resided for over 50 years. had been set up and Trustees appointed. The fundraising trust comprises Lord Fraser’s daughter, Katie Fraser, Roddy Harrison and Archie Mackay. Three Patrons have so far been appointed by the Trust. These are Prof. Richard Demarco, promoter of the visual and performing arts, Rev. Dr George Grubb, a former Lord Provost of Edinburgh and Captain Zbigniew Mieczkowski, an officer who served under the General in the 1st Polish Armoured Division. A presentation of a film “Baca. Remembering General Maczek” by Paweł Nuckowski was then shown. Mr Dariusz Adler, the Polish Consul General, kindly presented the honorary guests each with two books about the 1st Polish Armoured Division. The aim of the trust is to raise an estimated £100,000 to fund a bronze memorial to the General to be erected in the Meadows in Edinburgh. 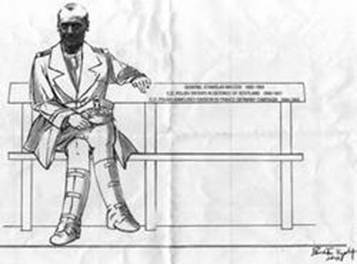 Its form in the style of the artist’s impression below with the General sitting on the bench but space for another to sit next to the General. 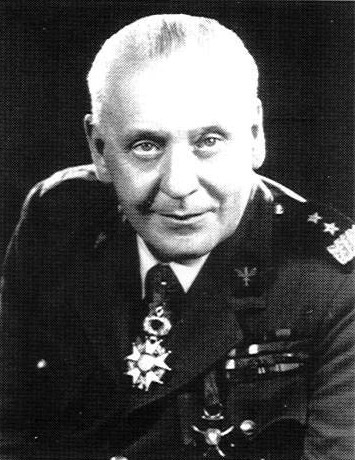 The General was born near Lwów in 1892. During the last war, he commanded the 1st Polish Armoured Division from February 1942 until May 1945. He saw service in the campaigns in Poland in 1939 and France in 1940 as the commander of the 10th Armoured Cavalry Brigade. On his return to Scotland in the Autumn of 1940, he was given command of the 10th Armoured Cavalry Brigade. His brigade was given the role of defending the important central sector of the Scottish east coast (Angus area) between October 1940 and April 1942. General Maczek was appointed by General Sikorski, the Polish Commander-in-Chief and Premier, to command the 1st Polish Armoured Division, which he started to form in February 1942 in Scotland. Based from April 1942 in principally the Lothians and the Border counties, soldiers of the Division were a familiar sight to the local Scots. Whilst there much work was undertaken to build up the Division into an efficient fighting force. A three-month spell in the Newmarket-Thetford area of England in the summer of 1943 allowed the Division to undertake inter-Divisional exercises. Back in its former area in Scotland there was a considerable amount of reorganisation of the Division and preparation for the forthcoming fight. In May 1944, the Division finally left Scotland for further training in North Yorkshire before eventually proceeding to the beaches of Normandy at the end of July 1944. In the campaigns in N.W. Europe, the Division fought in France, Belgium, Holland and Germany, principally within the 1st Canadian Army. Post-war the General commanded the Polish troops in Scotland until 1948. The present Campaign can trace its genesis back to the work started by the late Lord Fraser of Carmyllie as outlined below. Speaking at the launch at the New Club in Edinburgh on 29th March 2013, Lord Fraser stated that the U.K. and Scotland in particular owe a debt of gratitude to the great General Maczek and our lack of acknowledgement of him over nearly 60 years has not been honourable. He reminded the guests how he was asked by the British Government to be their representative at the Requiem Mass for General Maczek in Edinburgh in December 1994. Tragically and suddenly, he died in June 2013. In his speech in 2013, Lord Fraser proposed a metal bench with the General sitting on it but room alongside for those who are weary and heavy laden or young and vigorous to sit. It is this impression on which the present plans are based. (The President of the Republic of Poland, Bronislaw Komorowski salutes the 'Black Devils' of WWII). There is a link on this web page to events of 26 Feb 2015 at the Reception in the Scottish Parliament in Edinburgh. A full page of tydzień on 15th March 2015 was devoted to the General and the Memorial Campaign. Two articles by Captain (Ret’d) Mieczkowski – his speech at the Scottish Parliament and, ‘Scotland Commemorates General Maczek’ were published. The latter, with the author’s permission is presented below. Recommendation to be made an Honorary Companion of the Distinguished Service Order (DSO) added. Media link of 13 Apr to Polish Radio added. His recommendation for a DSO says much about his qualities as the GOC 1st Polish Armoured Division and that of his soldiers. The recommendation, originating in October 1944, and signed by Lt-Gen Simonds Acting GOC-in-C 1st Canadian Army, and by Field Marshall BL Montgomery, 21st Army Group and Lt-Gen S Kopanski, Polish Chief of the General Staff. Maj-Gen Maczek has commanded 1 Polish Armd Div throughout the period of its participation in the campaign in North West Europe and has on all occasions afforded it bold and resolute leadership and demonstrated outstanding skill as a tactician. Since it was first committed in this theatre this div has been engaged in the most varied types of combat. Heavy demands have repeatedly been made upon it, and the courage, determination and endurance of its troops have been subjected to the most severe tests. Special mention must be made in this connection of the bitter and savage fighting at Falaise and of the pursuit, relatively swift but with its attendant military difficulties, from the Somme. That this div has successfully met every call which has been made upon it and has established an excellent and enviable record in battle in attributable in large measure to the energy, skill and resources of Maj-Gen Maczek. His grasp and appreciation of the problems with which he has been con­fronted have consistently been quick and sound and he has shown marked ability speedily to formulate and carry out plans and to adapt the resources at his disposal to the changing requirements of any situation. By the force of his personality and his unending, concern for the welfare of his troops he has encouraged all those about him to quite extraordinary efforts. W szkockim parlamencie w Edynbur­gu, 26 lutego br., ogłoszo­no apel na cel budowy pomnika upamiętniającego gen. Stanisła­wa Maczka. Wśród licznie zgromadzo­nych przyjaciół Polski, około 200 osób, byli Mr Humza Yousaf – szkocki minister do spraw rozwoju Europy, brytyj­ski ambasador w Polsce – Ro­bin Barnet ambasador polski w Wielkiej Brytanii – Witold Sob­ków, Lady Fiona Fraser of Car­myllie – małżonka zmarłego w 2012 r. Lorda Frasera, projek­todawcy pomnika oraz szereg szkockich i polskich osobistości związanych z tą inicjatywą, po­pieraną przez polskie władze konsularne w stolicy Szkocji, z konsulem generalnym, panem Dariuszem Adlerem na czele. Prezesurę Komitetu Budowy objął były Lord Provost Edyn­burga, Rev. Dr George Grubb a w jego skład zaproszono szereg osób zaszczyconych godno­ściami patronów. Wśród nich znaleźli się profesor Richard Demarco, znany promotor polsko­-szkockich więzów kulturalnych łączących oba narody oraz Zbi­gniew Mieczkowski, uczestnik walk I Dywizji Pancernej pod dowództwem Generała Maczka. Administracja finansów podlegać będzie powstałemu w tym celu trustowi, w którego skład weszli: córka zmarłego projektodawcy Hon. Katie Fraser, jego były doradca, Ar­chie Mackay oraz prawnik, dyrektor biura Brechin Tin­dal Oatts Solicitors, Roddy Harrison. Projekt pomnika został wy­konany przez rzeźbiarza, arty­stę Bronisława Krzysztofa wg załączonego rysunku. Zostanie on umieszczony u wejścia do Uniwersytetu w Edynburgu, od strony parku The Meadows, przy którym swego czasu znajdowal się dom gen. Maczka. Uroczystość w parlamencie rozpoczęła poseł Jean Urquhart przemówieniem witającym ze­branych oraz zapraszającym ambasadom Witolda Sobkowa do omówienia celów spotkania. Następnie w kolejności przemawiali: minister Humza Yousaf, Archie MacKay z ramie­nia General Stanislaw Maczek Memorial Trust oraz Zbigniew Mieczkowski przedstawiający szlak bojowy generała i jego po­byt w Szkocji. Pokaz filmu reżyserii Pawła Nuckowskiego oraz Roberta Ostrycharza, zawierający wspo­mnienia o generale, zakończył ten bardzo udany wieczór. Przy kieliszku wina szereg uczestników, a wśród nich syn generała dr Andrzej Maczek, został obdarowany nowym wy­dawnictwem Bellony w redak­cji prof. Zbigniewa Wawera pt. „1 Polish Armoured Division". Prasa szkocka, jak „Edin­burgh Evening News" i inne gazety szeroko rozpisała się na temat polskich uroczystości. Szereg lokalnych, polskich pism zamieściło również wzmianki o generale Maczku i jego żołnier­zach. Ich szlak bojowy zostanie niebawem upamiętniony na go­ścinnej szkockiej ziemi.